This article is about the Washroom in the first floor. For the Washroom in the second floor, see Washroom (2F). 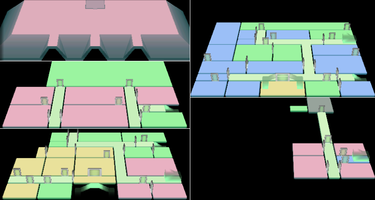 The Washroom (Japanese: トイレ Washroom) is a room in Area Two of Luigi's Mansion. After Luigi collects five Boos, Professor E. Gadd tells Luigi to go to the Washroom. When Luigi enters, he sees Toad crying in a corner. Toad says that he dropped something important inside the toilet. After Luigi reassures Toad, the lights in the Washroom turn on. 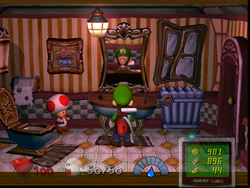 Afterward, Luigi opens the toilet for inspection and finds the Key to the Fortune-Teller's Room. The Washroom is quite cramped. Starting on the west side, there is toilet with an antique-style hanging tank, a mirror overlooking a sink, a radiator, and a medicine cabinet. The sink often contains a 10 HP or 20 HP restoring Heart for Luigi. If Luigi tries to go in the Washroom before he captures five Boos, he finds the door locked. A text box then comes up, reading, "Erm, OCCUPIED!" which is Toad's attempt to get rid of any ghosts that try to enter. Notably, the text box is purple, which is normally reserved for ghosts. This page was last edited on August 29, 2018, at 19:36.